Doesn't this look delicious? I only just discovered that I love shad roe. Up til now it has frightened me because when you buy it it looks like photo number two. Each roe comes as two sacks filled with thousands of tiny eggs that taste nothing like caviar. Shad live in the Atlantic, but swim up eastern rivers, including the Hudson and Connecticut Rivers, in order to spawn in the spring. Apparently it is a very old charming tradition for the people living along these rivers to have shad bakes (similar to clam bakes) when the fish are running. Shad roe is considered a delicacy by those who love it. 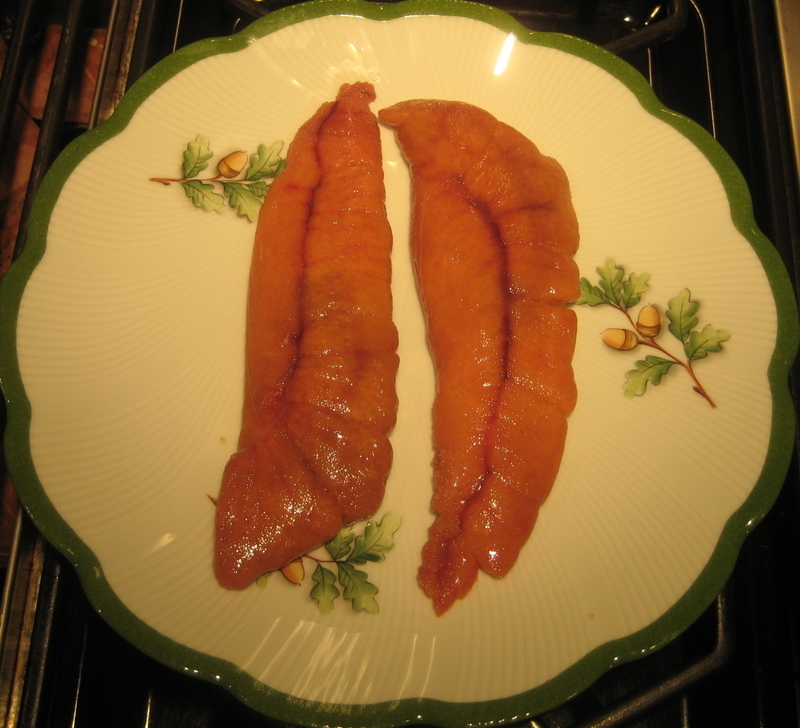 It is quite rich, so in my opinion one half roe (one sack) makes a perfect first course, and a whole roe makes a very filling main course. To begin, carefully separate the roe into four halves by removing the connective membrane. This is very easy, but you must take care not to puncture the sacks. Rinse the roe and pat dry. The roe must be completely dry in order to avoid splattering. Add the butter to a large non-stick frying pan, and heat over medium high until very hot, just before the butter begins to smoke. Obviously, you cannot allow the butter to burn. Gently place each roe into the butter. I found out the hard way that it is helpful to have a grease guard on hand. The objective is to brown well the outside of the roe quickly so it develops a light crust. The inside of the roe should remain pink. If the pan is not hot enough, by the time the outside has browned the inside will be overcooked. The first side should take about three minutes. At this point the sacks will easily hold together when flipped. Brown the second side as the first, and remove the roe to a warm plate and cover with foil. Now, while the pan is still hot, add the wine and turn the heat up to high. While the wine is boiling rapidly add the shallots and continue cooking until the wine has reduced by one third, several minutes. 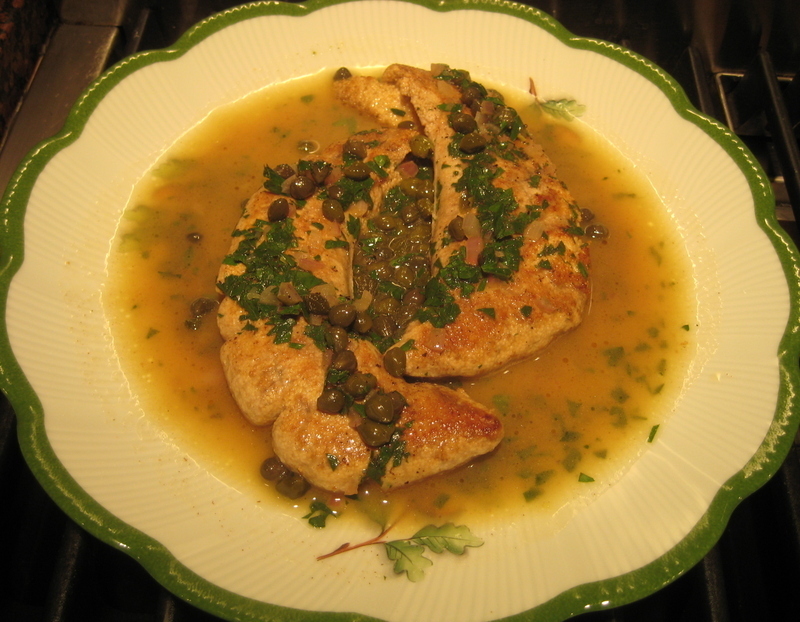 Remove the pan from the heat and stir in the capers, parsley and lemon juice. Spoon sauce over the roe and serve immediately. Everyone should try this at least once while it is in season.